Today is a special day for me and for Roma Mary Grace. Thirty-one years ago today Roma Clara Josephine Rasa Siegel left the physical world and became a guardian angel. She was a mother, grandmother, neighbor and friend to many. To me she was an inspiration and since that day I have often felt her presence in my life. In her hometown of Florence, Missouri, Roma was not only the keeper of family memories, she was known as local historian. She wrote down her memories of Florence detailing the general store she and her husband Carl C. Siegel ran for twenty years. Those memories were included in the town history books; including a re-print in the 185th Anniversary edition (2016). 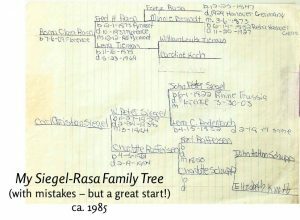 As I have explained in a previous post, my genealogical odyssey began in the 1980s – somewhere around the middle of that decade I had a homework assignment to complete my family tree. As luck would have it we were going to visit Grandma. My mom and I sat down with Roma and I still have the notes we both took on that Sunday afternoon. It is my first memory of talking about the generations of parents, grandparents, cousins, aunt and uncles, none of whom had I met. There were other conversations and stories related but that first one always sticks in my mind. Roma was born on July 6, 1909 in the house next to the Hummel Pottery factory on the main street of Florence, Morgan, Missouri. 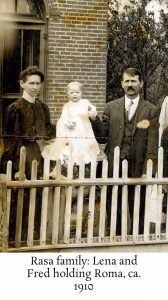 The photo below is one of her parents, Fred and Lena (Tieman) Rasa holding her up to see the band when she is nearing one year old. When she was eighteen she married Carl Christian Siegel. Together they raised a family. Carl died in 1964; Roma in 1988. Today’s remembrance is especially poignant because I have lost two friends in the last few days, one was brand new and the other I have known most of my life. My solace is that Paul and Roma just might be sharing a few cherished family stories, while Gail might just be chatting with Roma about how exciting genealogy is today with DNA and modern tools. Godspeed to Paul and Gail. Say Hi to Roma for me.